Even before the news that Irving’s knee is fucked up and full of goop, the Celtics were already going to head into the playoffs banged up. Gordon Hayward just started jogging, Daniel Theis is out for the season, and Marcus Smart’s thumb is torn. 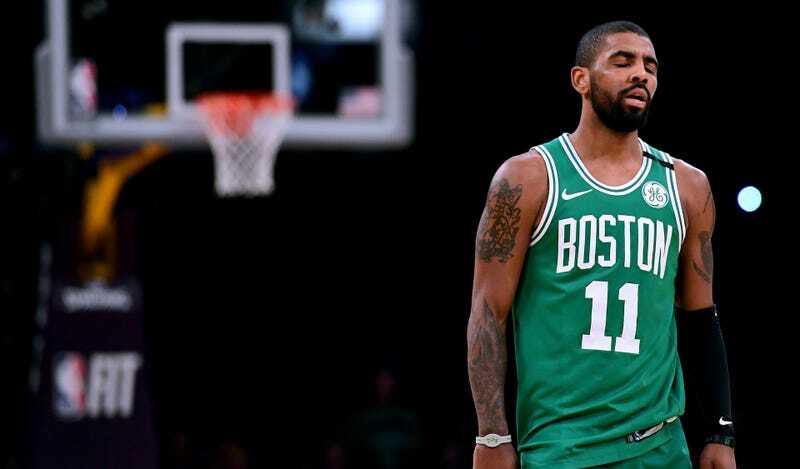 Their defense, which is still the best in the league over the whole season, has stayed at an elite level, but the loss of Irving probably spells doom for their already slipping offense. Backup point guard Terry Rozier has had a pleasant season, and the athletic Louisville product will probably have one or two very cool playoff moments now, but he’s a dreadful shooter everywhere on the floor besides from three-point range, and most of his minutes this season have come against opposing second units. Jaylen Brown and Jayson Tatum are good and cool, though neither are particularly adept ballhandlers. That’s the biggest blow here, since the Celtics really have nobody who can break teams down off the dribble or consistently produce out of the pick and roll. For all of Brad Stevens’s wizardry, Boston’s going to struggle to score enough against the East’s better teams in the playoffs, even if their bench is extra feisty. This stat says it all. Without Irving, the whole team comes to a screeching halt and scores like the Kings. Congratulations to LeBron James on another Finals appearance.